The first post-launch day DLC will be available to download tomorrow for free, if you have the Cerberus Network. BioWare announced on their forums that you will be able to grab two new items for use by Shepard and company in Mass Effect 2. The DLC goes live on Tuesday, February 9th at 2pm EDT for both the PC and Xbox 360 versions of the game. The items will not cost you anything, granted you have access to the Cerberus Network, BioWare's in-game store for Mass Effect 2. The Cerberus Network is free if you have a retail copy of the game, but will cost you $15 to access if you bought the game used. 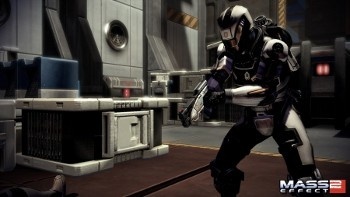 The Cerberus Assault Armor, pictured to the right, grants the wearer +10% heavy weapon ammo capacity, shields and health. From the item's description, "Cerberus assault armor is designed for shock troops, who are expected to turn the tide of battle against creatures or forces that would decimate normal soldiers." The second item is the M-22a Eviscerator Shotgun, which is purported to be a longer-range shotgun with armor-piercing loads. The announcement also mentions this tidbit, "This design also violates several intergalactic weapons treaties, so the M-22a is not distributed to militaries." Good thing Shepard's not in the military then. Oh wait.